The Starks reigned as Kings in the North until the Targaryen conquest and served as the region's warden for nearly 300 years. Following the imprisonment of his father, Robb Stark called his banners and marched his army south to free Lord Eddard. When Joffrey proved his cruelty, the North rebelled against the Iron Throne and declared itself an independent kingdom once again. Their army has since marched from victory to victory, due in no small part to the loyalty of the Northern soldiers to the Starks. This adult collectible is officially licensed from HBO's hit series "Game of Thrones." Each shield is individually serialized and will come with a certificate of authenticity. It also includes a wall mount with slots that will accept most swords to allow you to display up to three of your favorite swords behind the shield. The Game of Thrones Collection is a series of collectible weapons and armor painstakingly recreated from the actual props used on HBO’s hit fantasy epic �Game of Thrones." The officially licensed collectibles are made from the highest quality materials and have been crafted with special attention to reproduce the authentic details found on the props. This item is not a toy, please keep out of the reach of children. 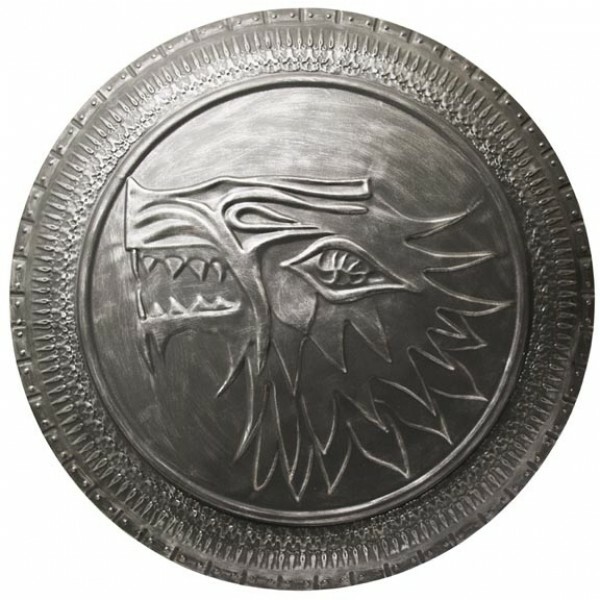 This replica shield is intended solely for display purposes as a collector's item Official HBO Licensed Product � 2013 Home Box Office, Inc. All Rights Reserved. Game of Thrones is a trademark of Home Box Office, Inc. 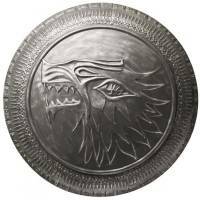 Produced under License by Jalic Inc.
Shield: Cold rolled steel with embossed direwolf sigil. Wall Mount: Black painted wood, 3 sword hanging slots.